Professor Brad Bishop is an expert in drunk driving law, he authored Drunk Drivers: The Law in Alabama and The Prosecution and Defense of DUI Cases; A Practitioner's Handbook. In addition, he is an expert in shoplifting law and authored The Law of Shoplifting: A Guide for Lawyers and Merchants. Bishop has recently appeared on National Public Radio (NPR) to discuss this topic. Bishop has chaired the Alabama Supreme Court Advisory Commission on Municipal Courts. He served as a municipal judge for the cities of Homewood and Pelham, Alabama, and currently serves as a municipal judge for Hoover, Alabama. Bishop is published in this area as well--Municipal Courts: Practice and Procedure in Alabama. In addition, Bishop is an expert in the law of contracts. 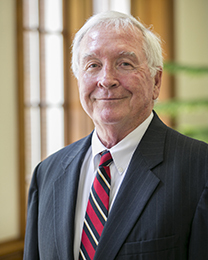 He has taught contracts at Cumberland School of Law for more than 30 years and he frequently lectures on the subject at national bar review courses.